WHO I FISHED WITH: This past Wednesday morning I fished with Jerry Worley and Jerry Blalack, both of Harker Heights, TX. The two men got to know one another when Jerry W., owner of Jerry Worley Insurance Agency, helped Jerry B. out with homeowner’s insurance. Although we had less than ideal conditions (light cloud cover on blue skies, bright sun, and light and variable winds), we enjoyed a solid start and then moved frequently after our first two hours on the water to keep the fish coming in the boat. When all was said and done we tallied up a catch of 69 fish. 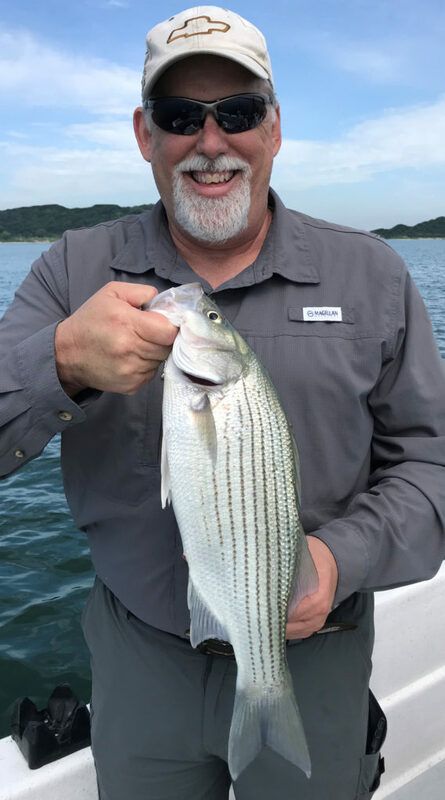 Jerry B. landed both the first hybrid striped bass of his life and the first largemouth bass of his life. He was raised in the Pacific Northwest and focused on trout, salmon, and sturgeon growing up. 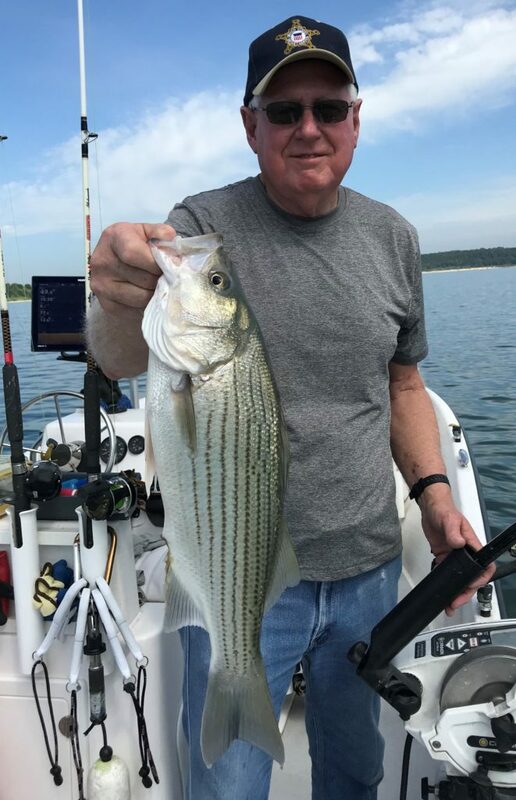 Harker Heights resident and U.S. Army Vietnam-era veteran Jerry Blalack caught the first hybrid striped bass of his life this past Wednesday while fishing Lake Belton. Jerry grew up in Washington and focused on trout and salmon growing up. Jerry Worley Insurance Agency owner Jerry Worley, also of Harker Heights came out with me for his 7th fishing trip with me through the years. 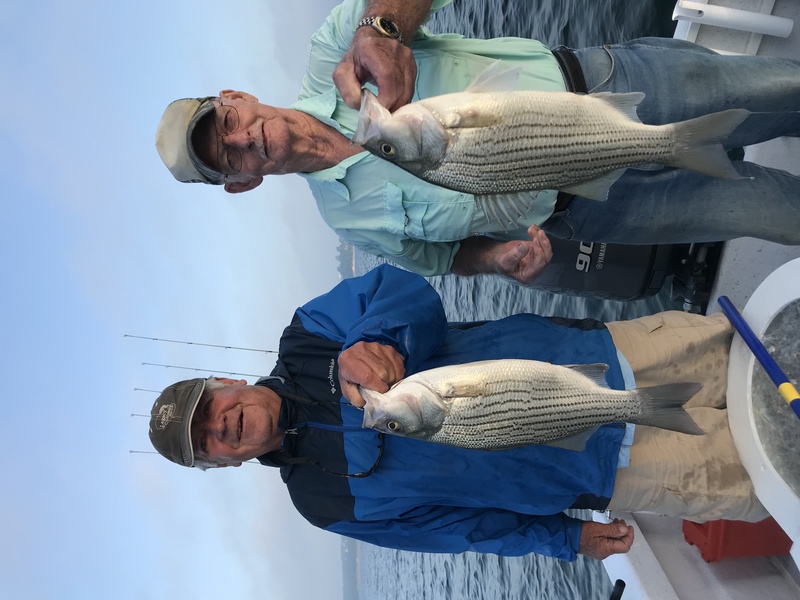 WHAT WE FISHED FOR: We targeted hybrid striped bass for the entire 4 hours this morning. The majority of our hybrid came in the first 90 minutes, we then struggled for about 90 minutes when the skies were brightest and the winds were lightest, then our last hour treated us pretty well as we landed a mix of white bass and hybrid stripers with a light but consistent S. breeze blowing and some high, thin, white cloud cover taking the punch out of the sun’s intensity. OBSERVATIONS/NOTES: 1) No pre-dawn shad sighted this morning and no egret/heron action on this very calm morning. 2) Post-sunrise pods of spawning shad sighted and netted at SHAD18 around 6:45a running along the rocky bank in under 1.5 feet of water. Water Level: 2.07 feet low and slowly rising thanks to Tuesday’s storms to our west. **Area B0089C through 1294 – moderate, steady hybrid and white bass action with some annoying small bluecat thrown in for ~90 minutes. 54 fish. 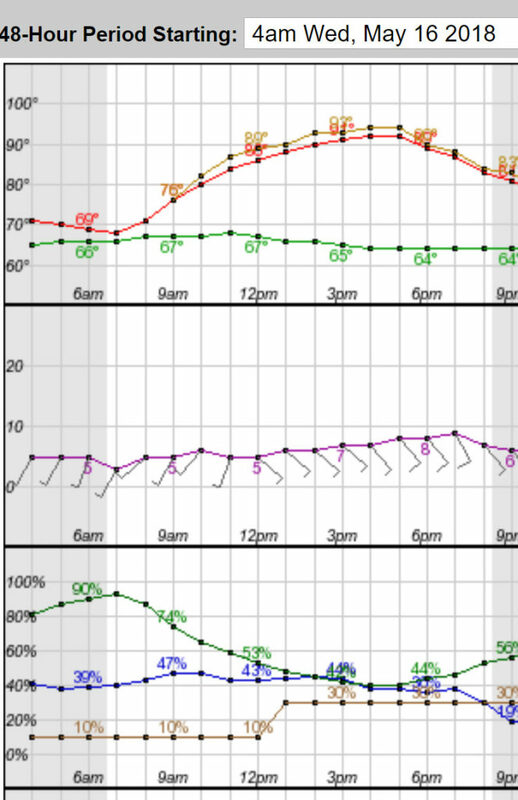 **Area 717 – moderate, steady hybrid and white bass action in our final hour. 15 fish.